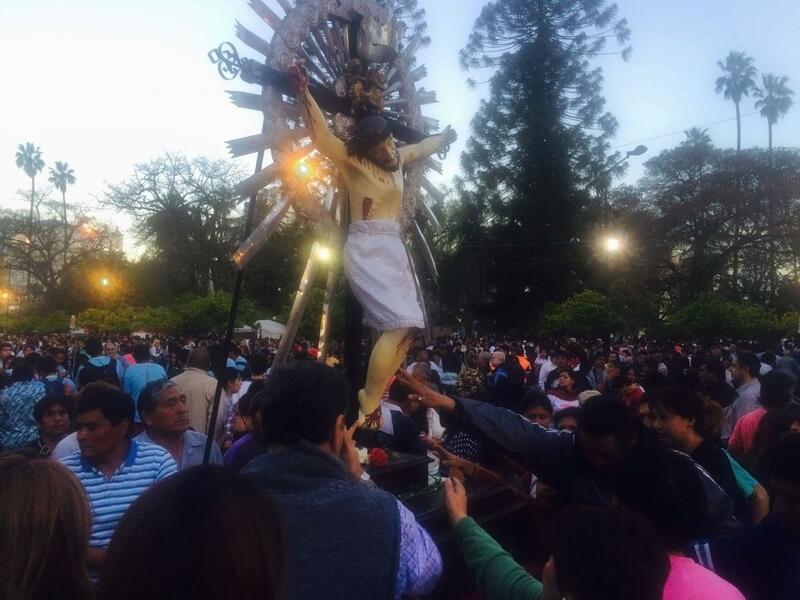 The image of the Señor del Milagro, a statue of the crucifixion, dates to the late 16th century. Like a number of prominent images in Latin America, its origin is attributed to a mystery. It was was found floating in a wooden box in the sea, bearing markings that it was destined for Salta, though there was no sign of the ship that brought it. The image of the Virgin was brought to Salta some time afterwards. 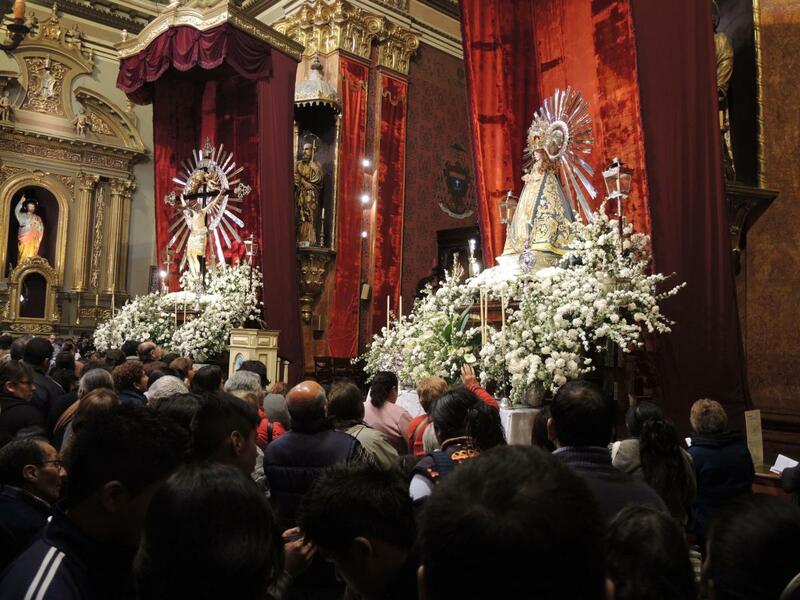 In 1692, when an earthquake struck Salta, the image of the Virgen del Milagro was found in the church at the feet of the Señor, both images undamaged in an otherwise ruined church. The clergy and people brought the images outside of the church for veneration, attributed their survival to these patrons’ miraculous intercession, and began a tradition of processions to give thanks and pray for the wellbeing of the city. 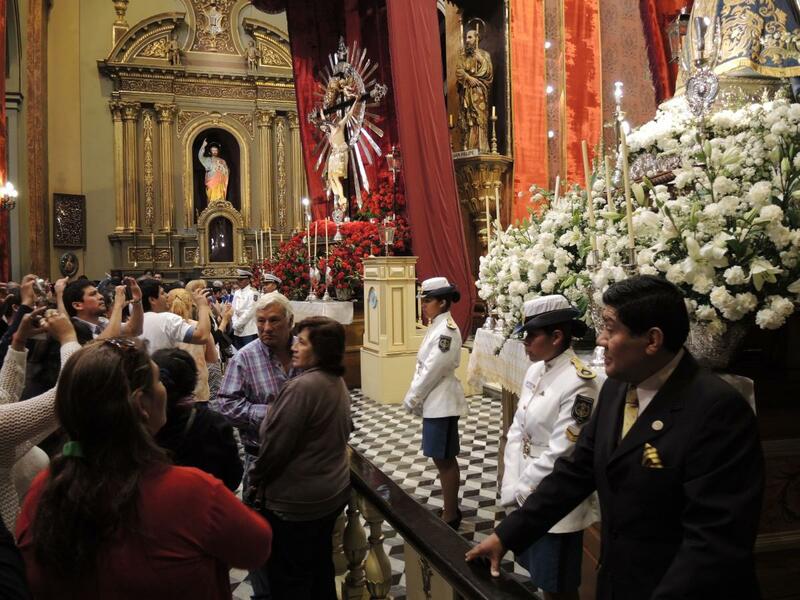 Though the main days of the feast are Sept. 13-15, public events begin in July, when the statues of the Señor y Virgen are moved forward in the cathedral, next to the main altar. Many times a day for the next month, schools, including all public schools, are allotted times for pilgrimage Masses at the Cathedral. A novena — a form of devotional prayer that lasts nine days — runs from September 6 to 14. Inside and outside the cathedral, from day to night, people of all ages stand or sit for extended periods quietly reading the 19th-century novena prayers from booklets sold by vendors all around the square. A European or American would likely find it hard to comprehend, given the decline in popularity of that form of prayer in those places in recent decades, how many young couples can be seen praying the novena at all hours. 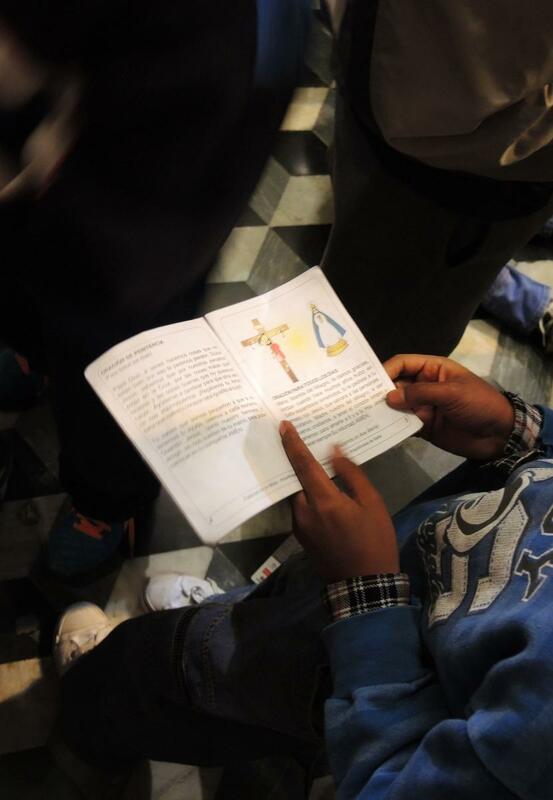 There is even a novena booklet for children. The language of the novena is emotive and highly devotional, but not abstract. 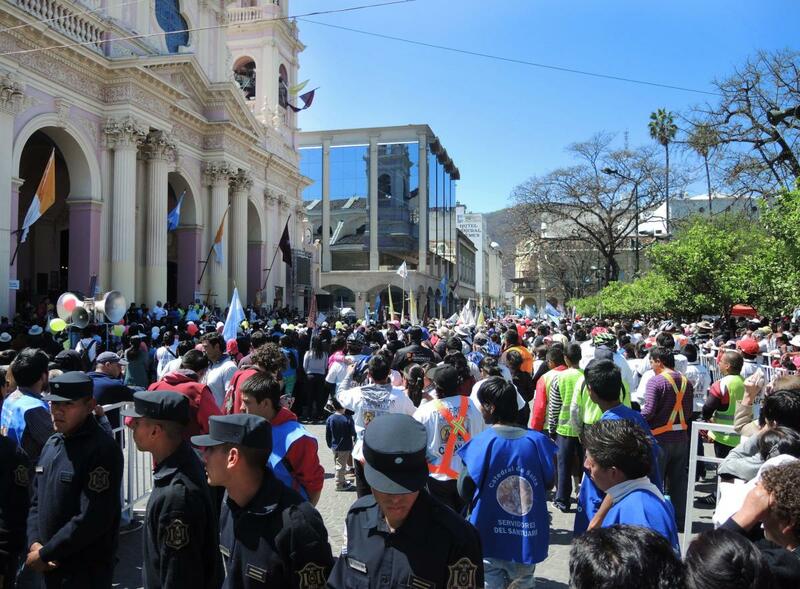 It links the Lord and Virgin to each devotee, and the whole city of Salta, in an intimate fashion. Jesus is invoked as a sweet, merciful, humiliated redeemer who accepted his death for our sake despite our sinfulness. Mary is entreated as a most pure, motherly protector. Both are described in royal terms, but the language and metaphors about the Virgin are much more expansive. Mary is described in different days’ prayers as the sun, a star, a dove, the door of heaven, a garden, and the water of life. For pilgrims from outside of the city, the events unfold differently, and certainly less quietly. 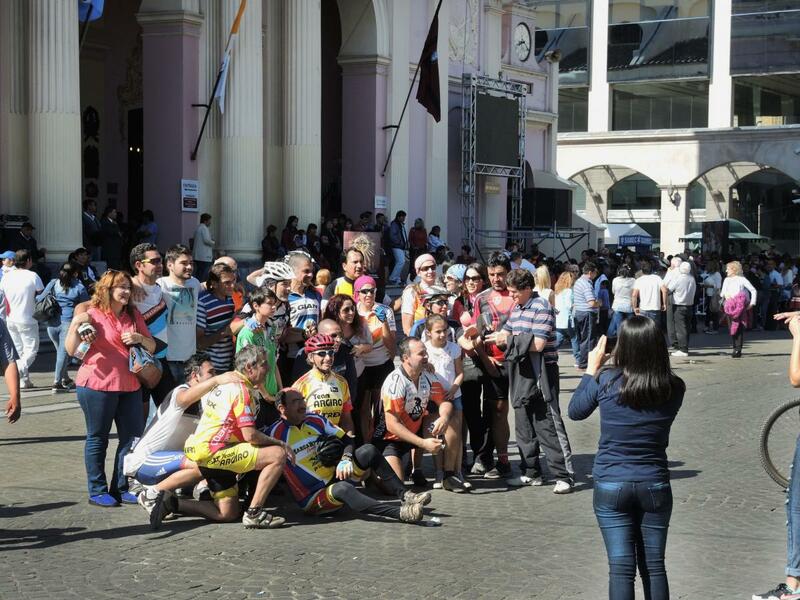 In 2015, more than 60,000 pilgrims presented themselves in groups on the steps of the cathedral.4 They traveled for two to six days primarily on foot, but also as cyclists or occasionally on horseback, a nod to the idealized gaucho history of the region. 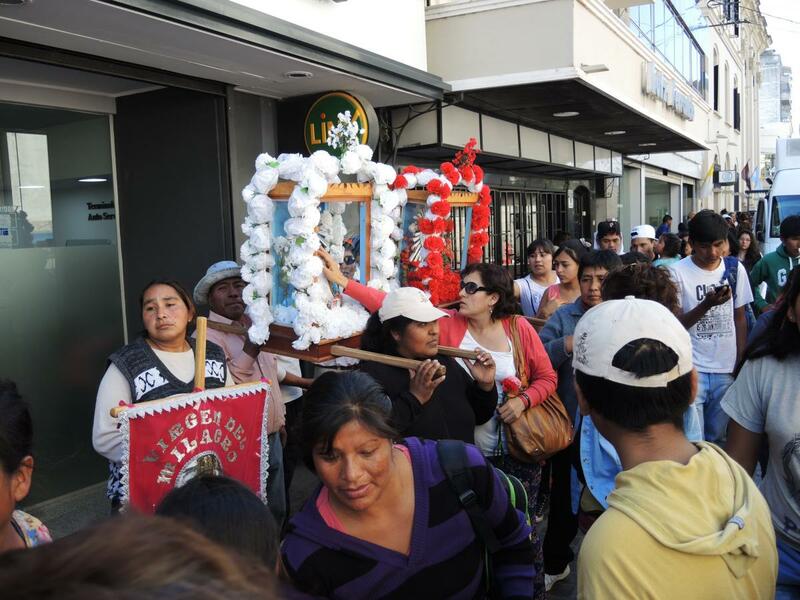 Many, but not all of the pilgrims, especially those who walk, are indigenous peoples, which is not surprising given that the towns in the province of Salta, especially the smallest villages, are largely indigenous. 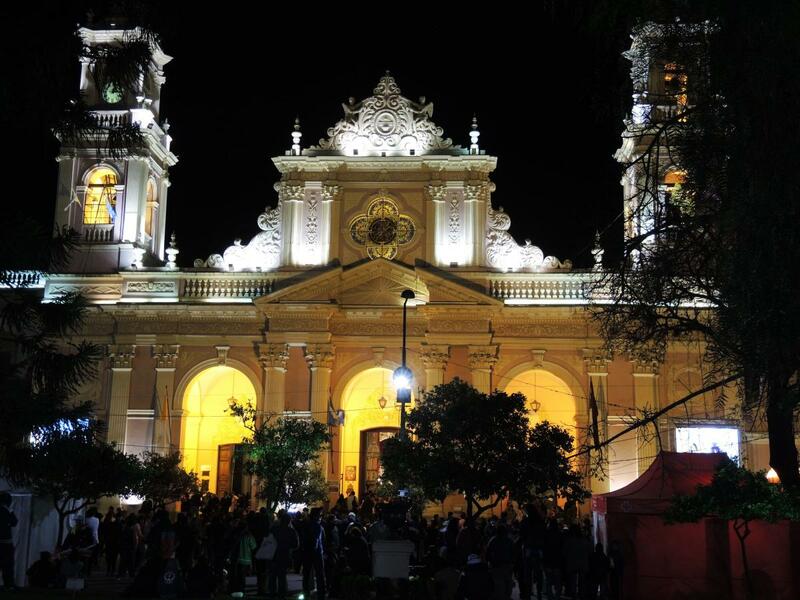 By September 13, as pilgrims start to arrive, the city of Salta is transformed to celebrate the patrons of Salta, who are said to have saved the city 323 years ago. Schools are closed for the week, and most businesses close September 13, 14 and 15, which are official holidays in the province. Even the city’s popular street fair is nearly empty during the day, though at night cafes in the same areas will get crowded with visitors. 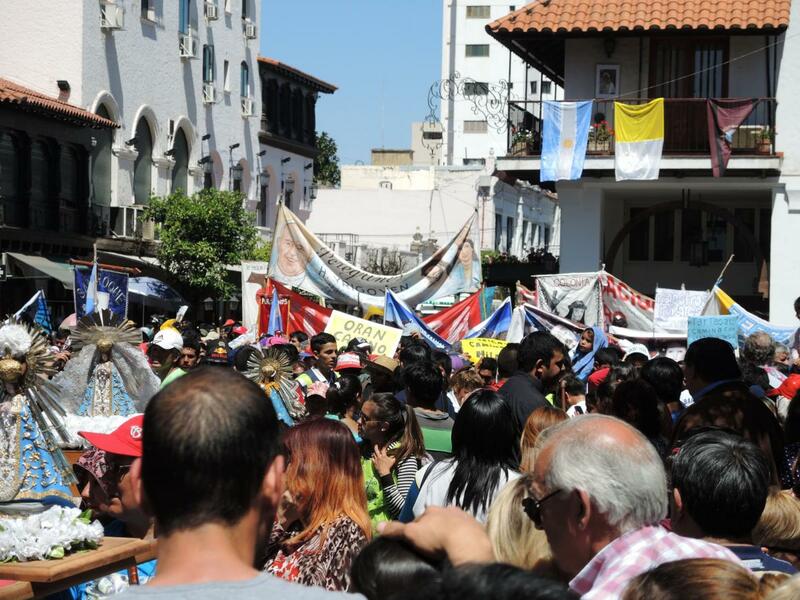 Despite the fact that stores and businesses are closed these days, Catholicism, business and politics mix freely at the feast in ways not typical of Argentina, though surprising by many other countries’ standards. 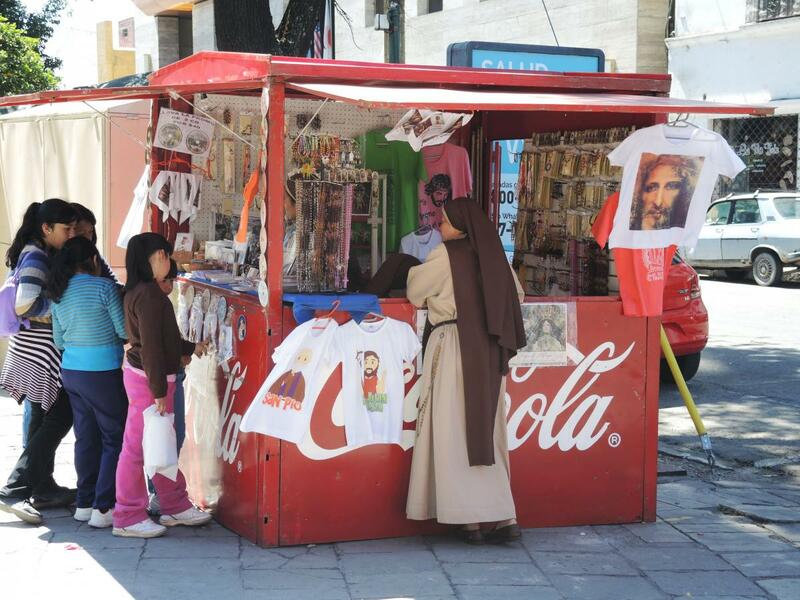 The role of business is not primarily evident in the selling of trinkets and food, but in the number of times when the images of the Señor y Virgen del Milagro are displayed in stores, malls and in advertising. 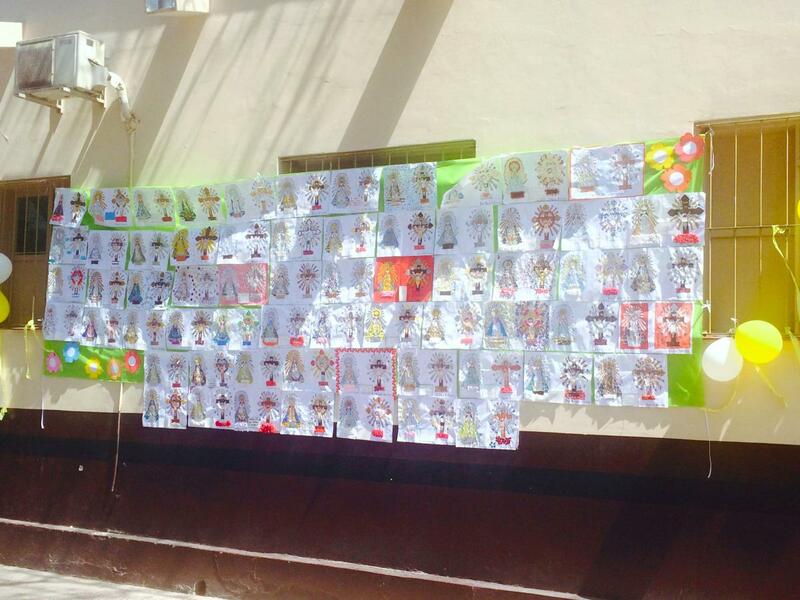 In 2015, one local newspaper featured a full-page color insert of the Señor del Milagro that was sponsored by an insurance company. 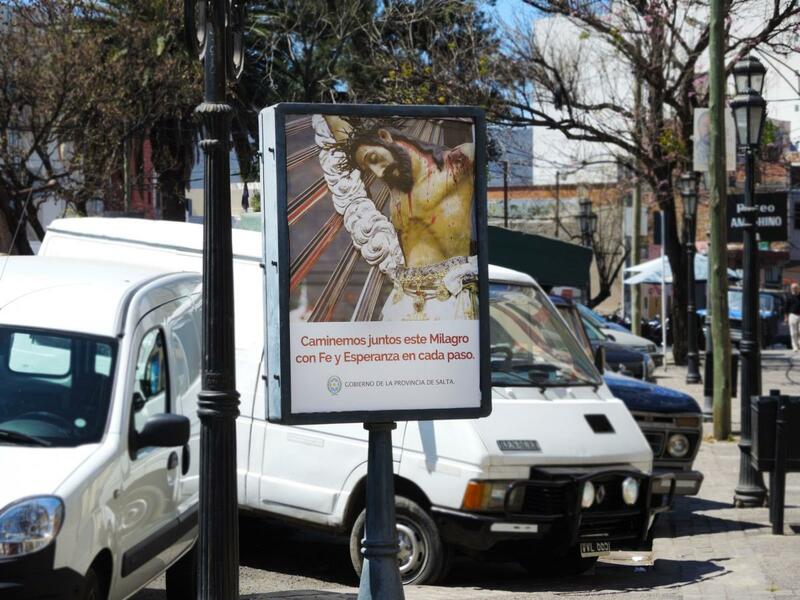 Many other companies had newspaper advertisements that paid homage to the Señor y Virgen del Milagro the way businesses in other countries might wrap themselves in the flag around patriotic holidays. Though the rest of the city is quiet, the square and its environs are full of the activities surrounding reception of pilgrims. Salteños lining the arrival path often know a good deal about which groups are coming, and can comment about what each had to endure. The pilgrims who garner the most respect are those who have had the most difficult, or longest, journey. Pilgrims settle in all over the city, in churches and schools and houses. 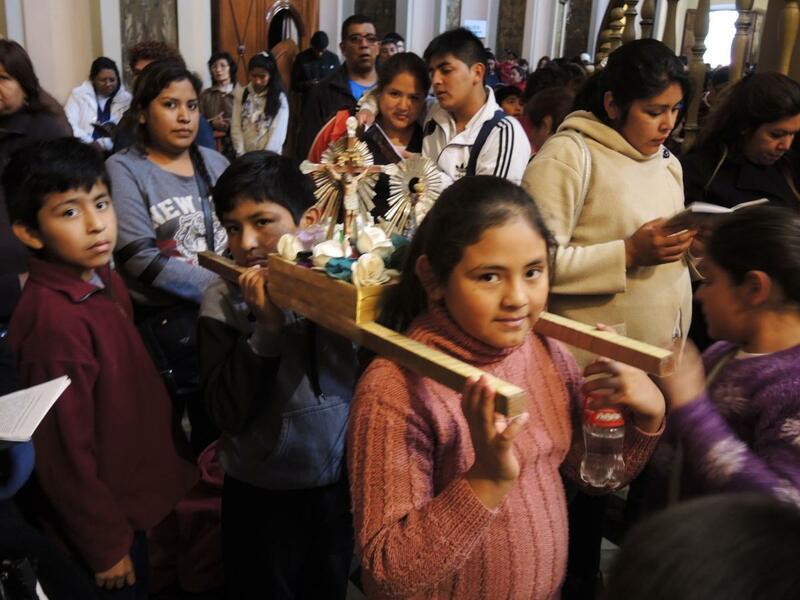 Many pilgrims bring their andas, images of some patron saint or saints on a shoulder-borne carrying platform, where people stop by to caress them and the bearers are happy to talk about their devotion to the saint. 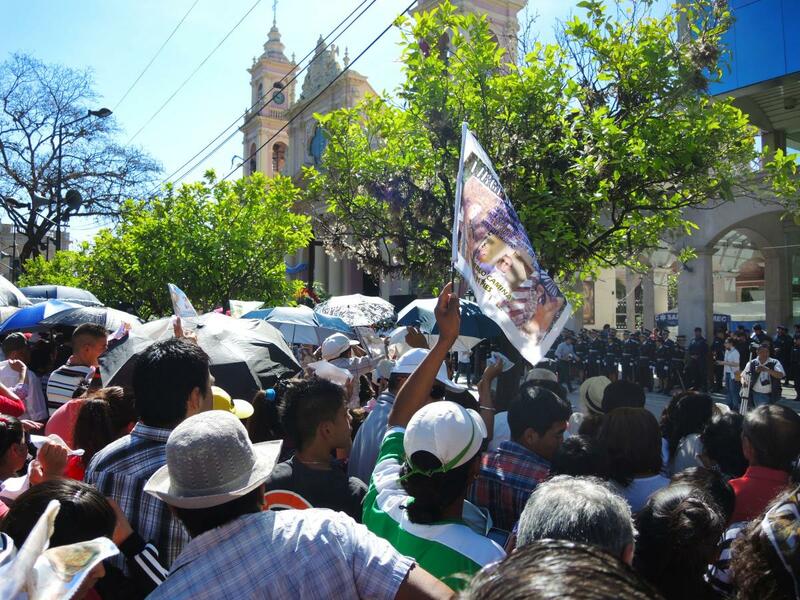 That evening, a crowd gathers for a penitential procession from St. John the Baptist de la Merced church. 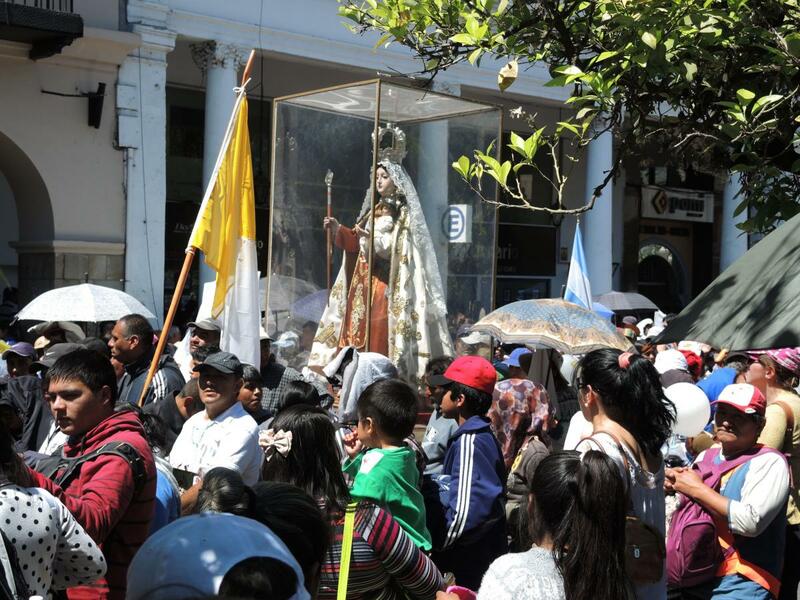 This procession recalls the original penitential procession in 1692, but is now a comparatively small event, with a crowd of about 2,000 pilgrims that stretched a few blocks. 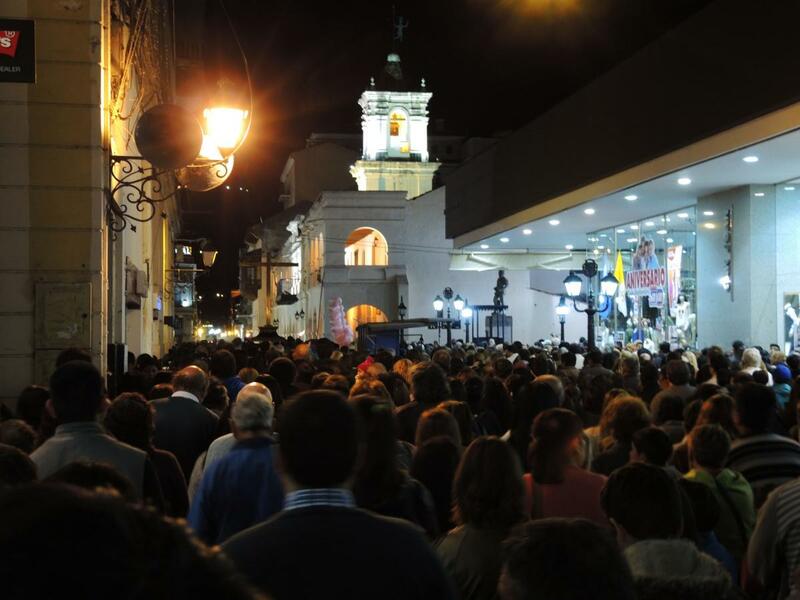 Their prayer and song include the most typical refrain of the feast, “Señor del Milagro, don’t take your love away from Salta, Señor del Milagro, don’t take your love away from Argentina.” Through the evening, crowds of several hundred people of all ages stand inside and outside the cathedral praying the novena. September 14, in most of the world, the church celebrates the feast of the Exaltation of the Cross, and here the day is marked by many Masses, the arrival of more pilgrims, and novena prayers at night. The cathedral is open through the night. September 15 is the Solemnity of the Lord of the Miracles. 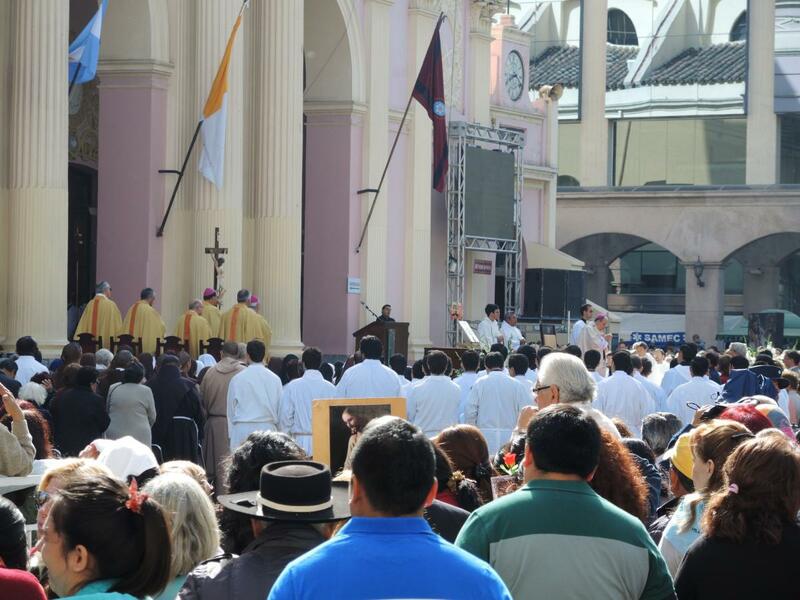 In the morning, the archbishop celebrates Mass in front of the cathedral, while crowds continue to pass by the statues on the inside. In the afternoon, at 3:30 p.m., the major procession begins. 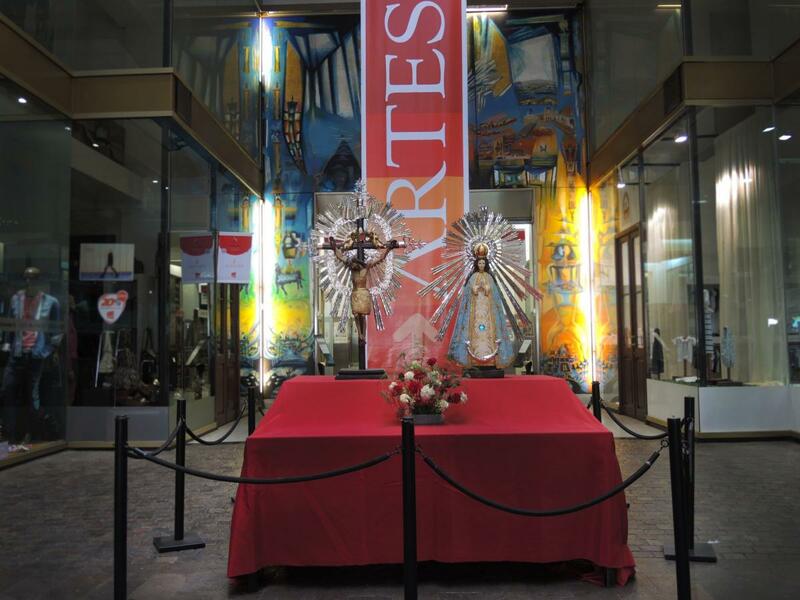 Over the course of 30 minutes, a huge, plain wood “primitive cross” and a painting that is said to have miraculously cried in the 18th century begin the procession, followed the images of Virgen and then the Señor y del Milagro that are the primary focus of attention. The procession travels 2.3 km in each direction, and crowds that line side streets join in it as they can. 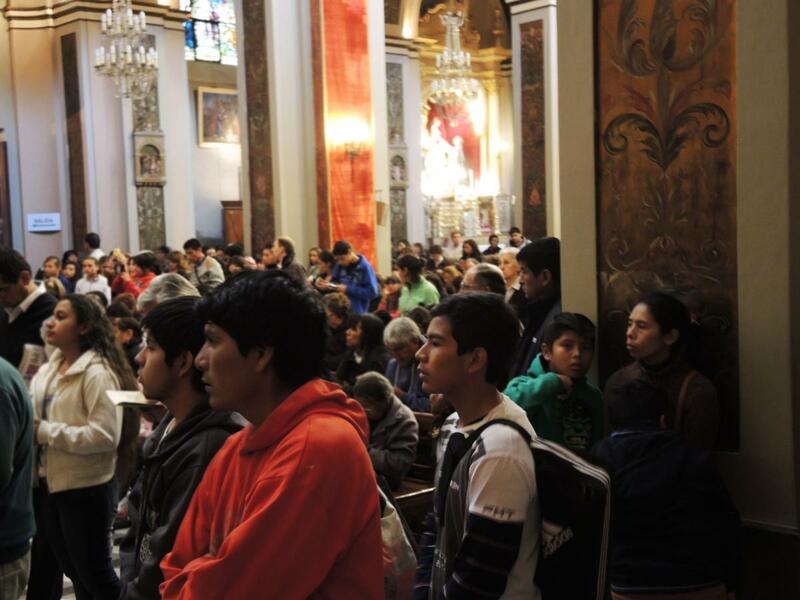 Salteños renew their pact of fidelity to the Lord and Virgin of the Miracle. The latter statues are surrounded on bases with thousands of red (for the Lord) and white (for the Virgin) carnations. 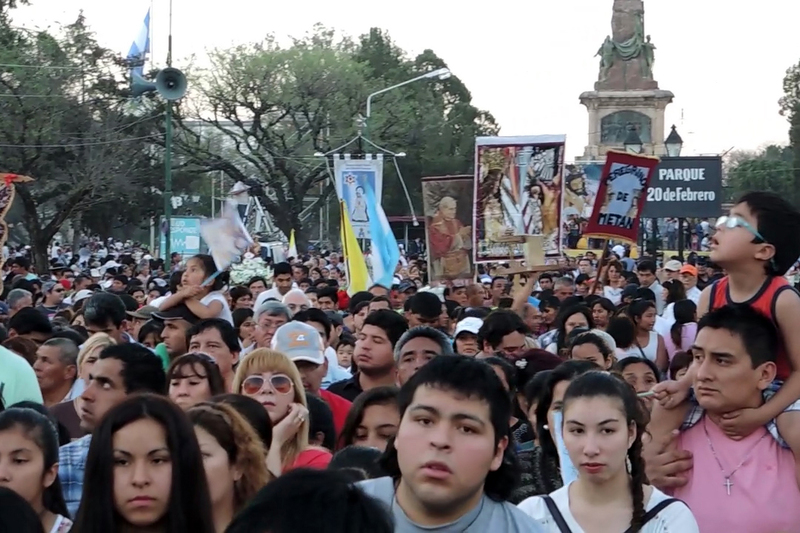 The procession travels from the cathedral to a plaza that commemorates an important battle for Argentine independence. 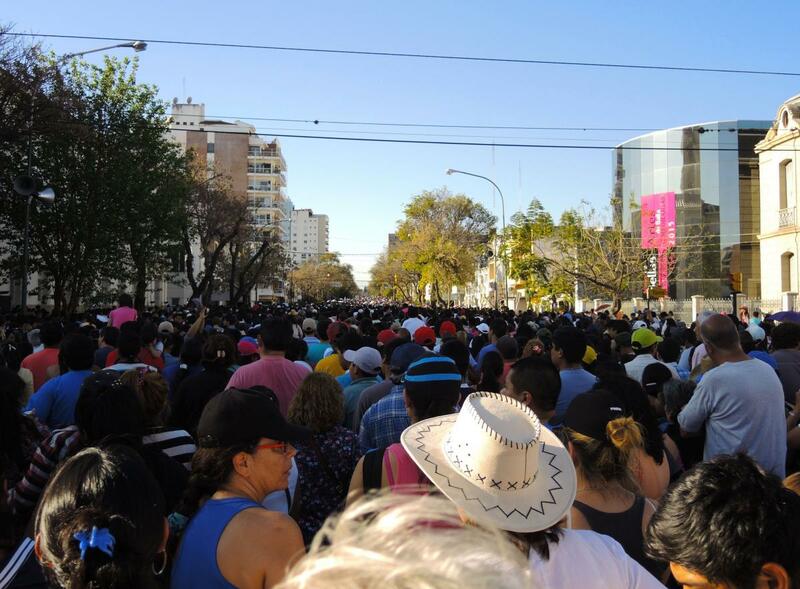 By the time it reached the Parque 20 de Febrero, 800,000 people are said to have joined it in 2015, far more than the park could hold. 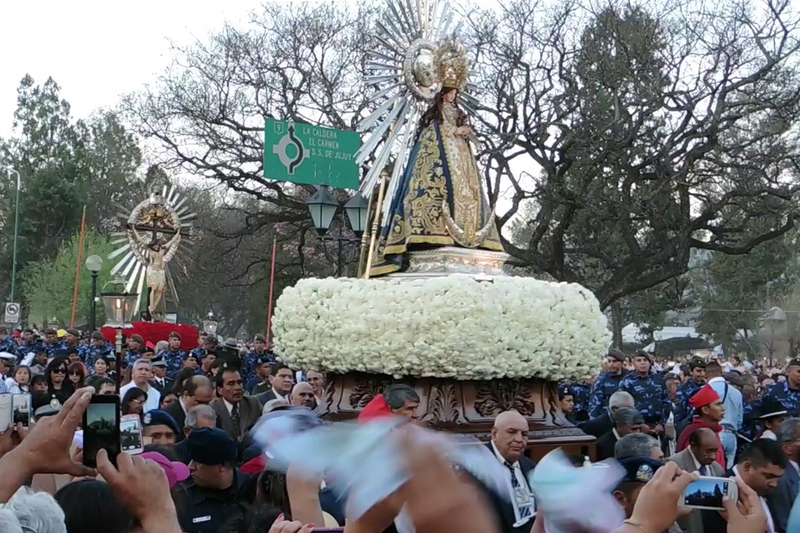 Many of the andas are carried in the procession, where they line the sides of the path and face the large statues of the Señor y Virgen del Milagro. The statues are moved into place, the Archbishop preaches, there is singing, and then a renewal of the Pact of Fidelity before the statues begin a long procession back to the cathedral. The important role of “place” is distinguished in three ways. 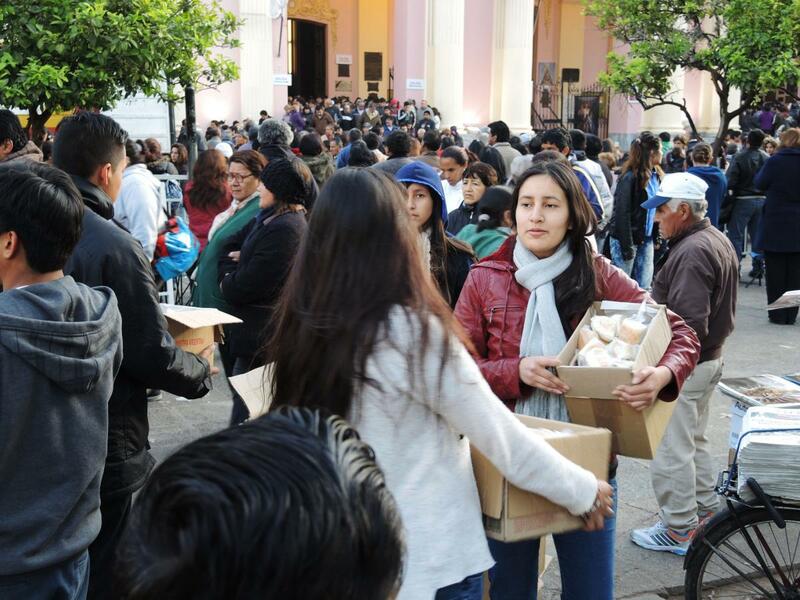 First, the feast is a time when the whole of the local church travels to the cathedral, something that happens in few cities in the world. 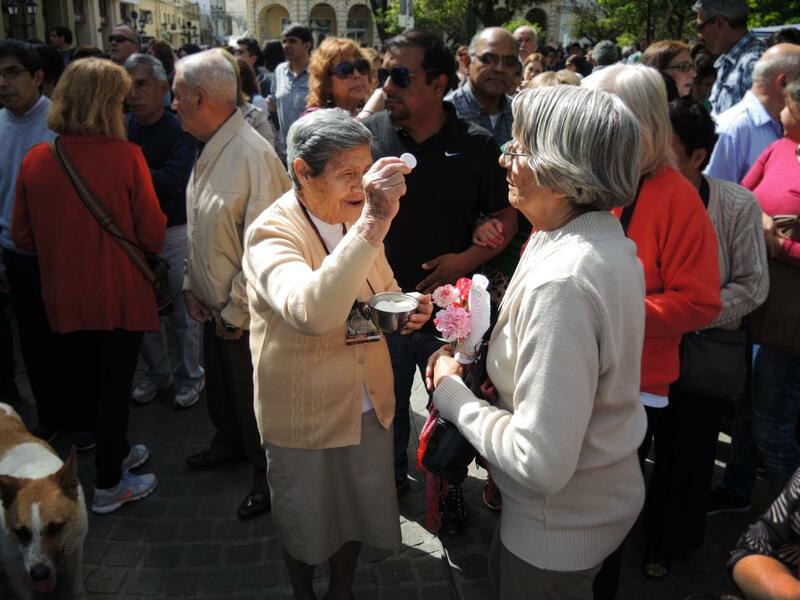 The popular devotion does not seem to be separate from official belief, though the hierarchy seems to work carefully to hold the two together, and reminds believers in official programs that that one “cannot exchange promises [candles and other offerings] for a good confession, Communion, and works of charity.” Second, as is true for many more Marian feasts, the biggest assembly occurs when the statues are brought out of the church, into the streets where people live. 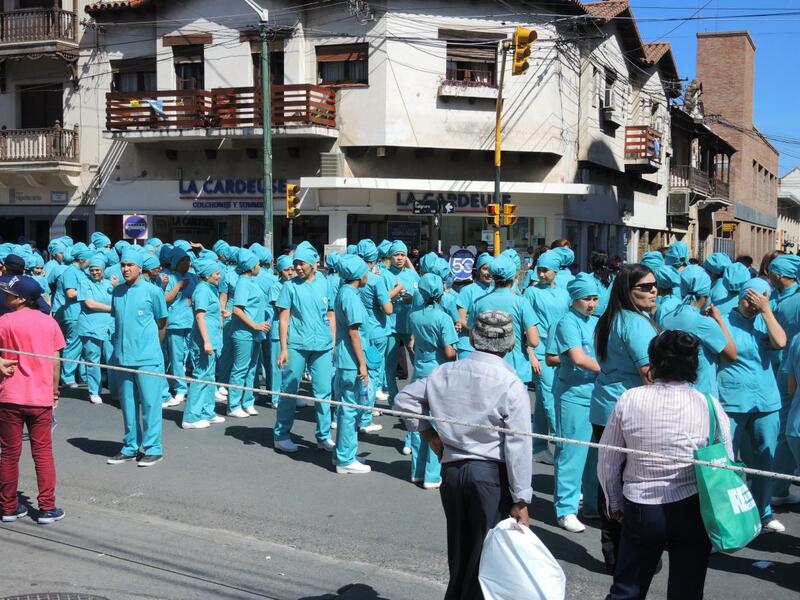 Finally, the procession leads to a major civic space, a park that celebrates the military and an important battle for Argentine independence. The central events take place in front of the park’s huge main statue, and to the left and the right in the park and an old tank and an old jet. Major civic officials, police, army have formal places of honor, and the national anthem is sung. The archbishop addressed the huge audience with a long sermon, during which he explicitly addressed the candidates for election, naming them and asking them to protect the people, especially the poor, the young and the old, and not just to think of their own interests. He told the poor and the old in turn that they have rights and owe nothing to the state. At the same time, this all occurred in a context that very much brought church and state together. When asked about this, locals always downplayed the importance, but as acted out, the connections were very real. 1. The account given here is based on participant observation September 11-16, 2015. Thanks to Paula Hernandez for assistance in research and translation. 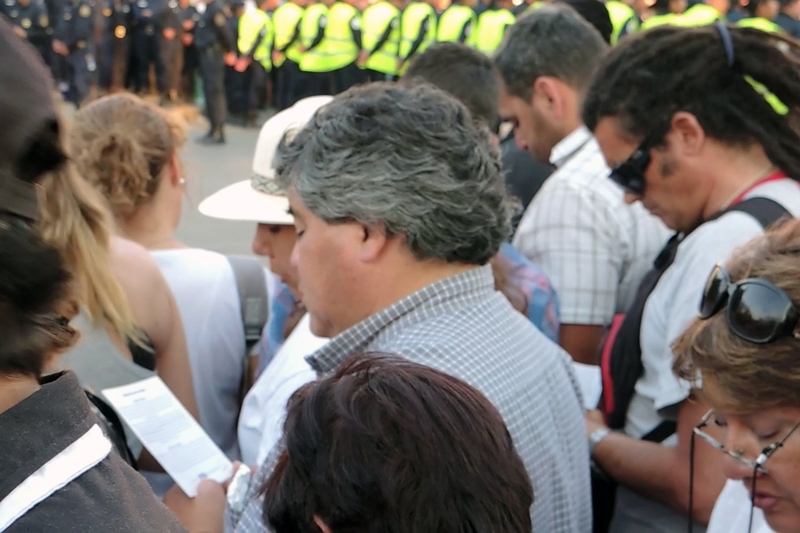 One interviewee, a man who was raised Catholic but described himself as not at all religious, and unhappy about religion’s public role in the city, insisted that very few people “maybe 5%” in the city of Salta are not involved with the feast. “People are crazy here. You can’t believe how this takes over the entire city,” he lamented. 2. 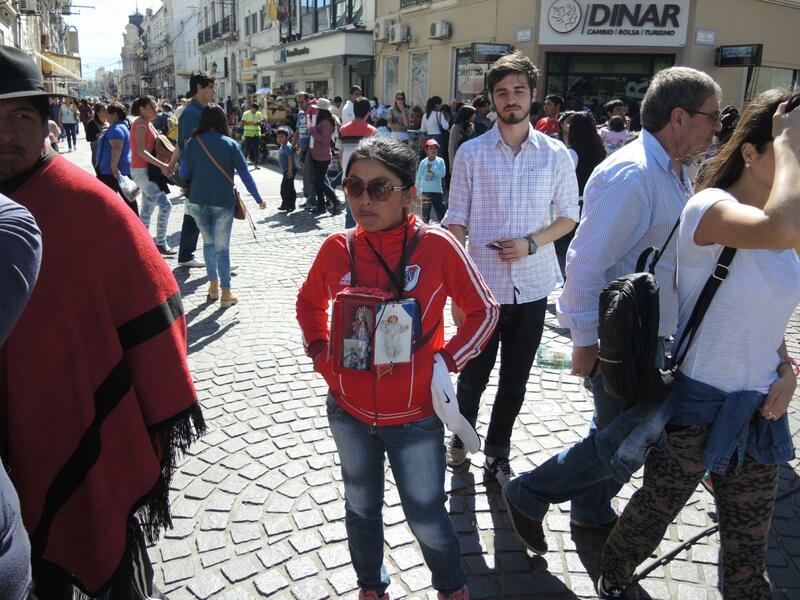 Total numbers are from El Tribuno, September 16, 2015, 1 and 3, while the number of pilgrims was given in the same paper on September 14, 2015, 1. Both times the paper cites police figures. 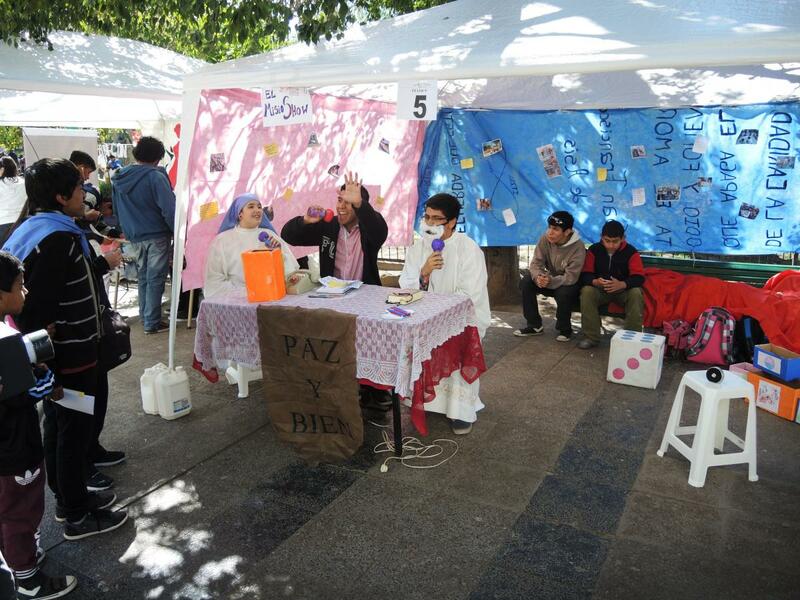 Almost all of the participants, so far as the author could tell, were Argentinian. 4. 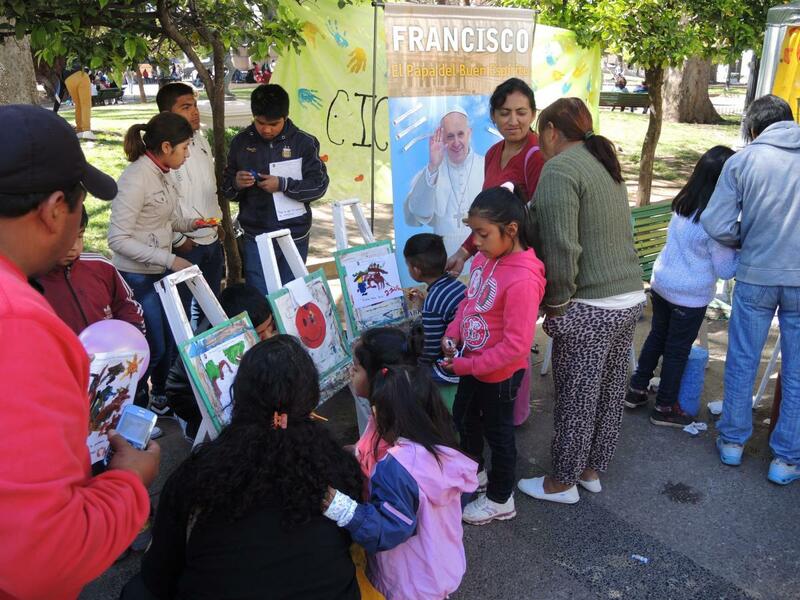 El Tribuno, September 14, 2015, 2, citing archdiocesan figures. Police and towns along the way so carefully manage the pilgrimage and accommodations that the numbers are easy to verify. The official cronograma of the pilgrimage, lists many pilgrim groups, but it was clear at the cathedral that there were more groups who came that were not on that list. 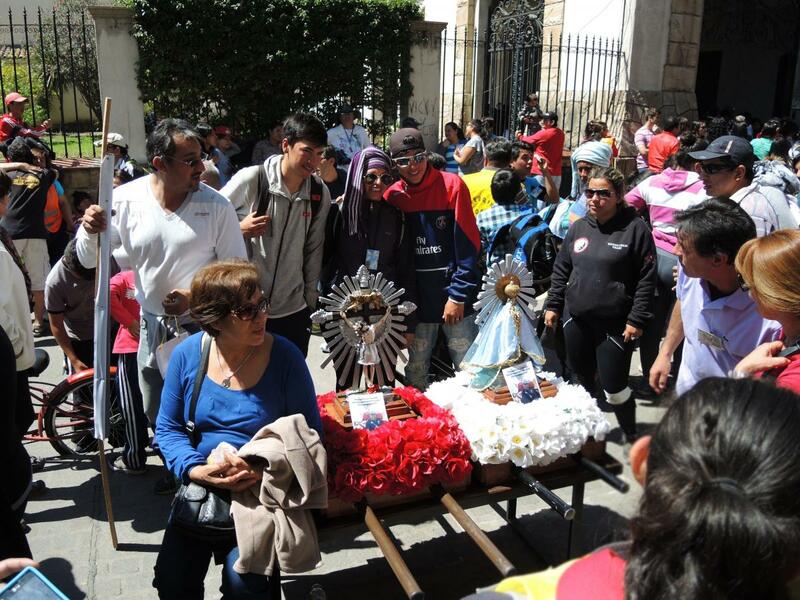 Pilgrims play a large and communal role in the feast of Señor y Virgen del Milagro, held in Salta, Argentina September 13-15 each year.